What began as a problem with the Trent 1000 Package C compressor and subsequent problems with turbine blades wearing out sooner than expected, has now seen Rolls-Royce ramp up the number of more rigorous inspections of the engine after liaising with authorities over a separate issue. The engines have needed unscheduled maintenance due to parts wearing out more quickly than anticipated, and last month Rolls-Royce said it would take a hit of around £340m to cover the cost of repairs on existing engines. Boeing has indicated that approximately 25% of their Dreamliners are powered by the Trent 1000 engine Rolls-Royce has confirmed it will reprioritize spending to mitigate the additional costs, but intends to keep guidance for free cash flow at the £450 million (US$643 million) mark. 380 of the engines in question are currently in service, with Rolls-Royce confirming that this new approach will not affect Trent 1000 Package B engines or Trent 1000-TEN engines. In December 2017, the European Aviation Safety Agency (EASA) ordered airlines to replace some Rolls-Royce Trent 1000 engines. Pratt & Whitney will expand its global network of providers that maintain the Geared Turbofan™ (GTF) engine to include five repair suppliers that will support the PW1100G-JM engine. 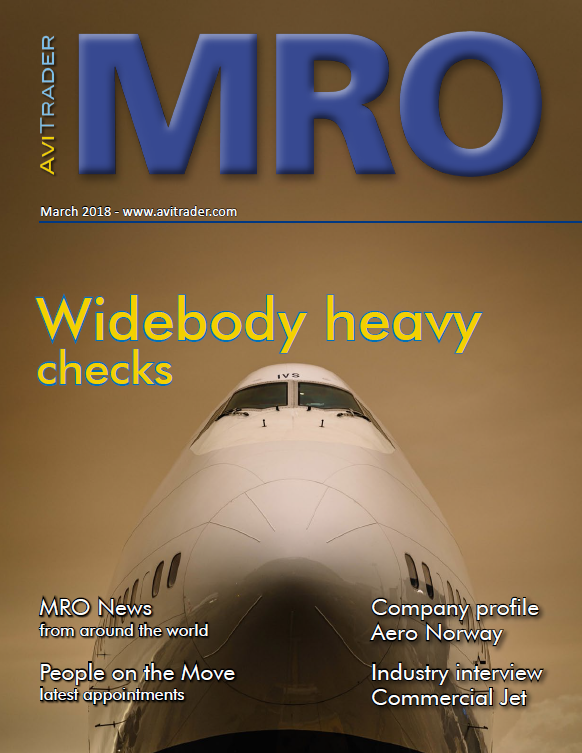 Turbine Controls, StandardAero, TWIN MRO, ACMT and Lewis & Saunders will join other GTF maintenance, repair and overhaul (MRO) providers located around the world. The GTF MRO network currently includes Pratt & Whitney, MTU Aero Engines, Japanese Aero Engines Corporation, Lufthansa Technik and Delta TechOps. "Shop visits for the GTF engine will continue to grow over the next few years, and it is imperative for Pratt & Whitney to establish a strategic supply base now to enable us to deliver world class turnaround times and reduce cost for our airlines customers," said Heather Walton, senior director, Aftermarket Supply Chain at Pratt & Whitney. "This is an important milestone in repair sourcing as these are the first third-party suppliers to join the GTF engine repair network. These suppliers have had long-term relationships with Pratt & Whitney and deliver a high level of responsiveness, exactly what we are looking for to support our repair network for the GTF engine for years to come." The A330neo is demonstrating its capabilities as the newest member of Airbus’ proven and highly-reliable twin-engine A330 Family, with flight testing continuing ahead of its planned service entry in Summer 2018. Two test aircraft have logged more than 700 hours aloft in the 200-plus flights performed as of April 10, according to A330neo aircraft integration and flight testing integrated product team (IPT) leader Jean-Christophe Bonjour. 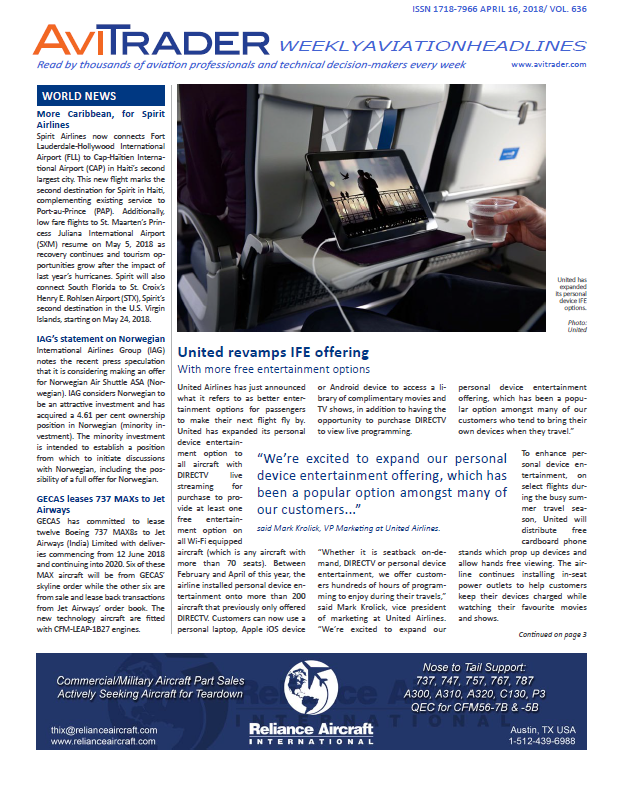 He noted that flight testing has covered the globe, including the cold weather validations in Kazakhstan in temperatures as low as -27° C., natural icing testing in the United States, crosswind landing evaluations in Ireland, a Bolivia-based altitude campaign at 8,000 ft., and recently-completed hot weather trials in Mexico, which had temperatures of up to 37° C.
The new-generation A330neo, powered by highly-efficient Rolls-Royce Trent 7000 powerplants, has a longer wingspan with new high-efficiency Sharklets and incorporates Airbus’ innovative Airspace cabin that it has in common with the A350 XWB. Further improving the A330neo capabilities is the launch of an increased-range version, with a nine metric tonne increase to the maximum takeoff weight to 251 metric tonnes. This provides up to 1,500 nautical miles more range when compared to typical A330s in service today, enabling airlines to open new markets, while radically improving aircraft economic efficiency, Hamilton added. Dubai-based flydubai’s inaugural flight touched down on April 15, at N'djili Airport (Kinshasa International Airport - FIH). flydubai will operate daily flights to N’djili Airport with an enroute stop in Entebbe. With the start of flights to Kinshasa another gateway is opened up for passengers from the GCC, Russia and the Indian Subcontinent into Central Africa. Passengers from Kinshasa have access to more than 90 destinations on the flydubai network and through its codeshare partnership with Emirates (www.Emirates.com) can connect easily and conveniently to Emirates’ destinations spanning six continents in over 80 countries. AviaAM Leasing, a Warsaw Stock Exchange listed aircraft leasing company, has delivered an Airbus A321-211 aircraft to Air Transat, a Canadian low-cost leisure airline based in Montreal, Quebec for a 10 year operating lease. Air Transat is the first client of AviaAM Leasing in North America region. Professional work of both parties led to an early aircraft delivery to the client, thus making a solid foundation for future cooperation. The aircraft was delivered to the client fresh from C-check. Boeing has made an investment in Reaction Engines, a leader in advanced propulsion systems based in Oxfordshire, United Kingdom. Reaction Engines' technology will contribute to the next generation of hypersonic flight and space access vehicles. Reaction Engines is known for its Synergetic Air-Breathing Rocket Engine (SABRE), a hybrid engine blending jet and rocket technology that is capable of Mach 5 in air-breathing mode and Mach 25 in rocket mode for space flight. As part of the SABRE program, Reaction Engines developed an ultra-lightweight heat exchanger that stops engine components from overheating at high speeds, thus improving access to hypersonic flight and space. "As Reaction Engines unlocks advanced propulsion that could change the future of air and space travel, we expect to leverage their revolutionary technology to support Boeing's pursuit of hypersonic flight," said Steve Nordlund, vice president of Boeing HorizonX. Delta Air Lines has reported financial results for the March quarter 2018. Adjusted pre-tax income for the March 2018 quarter was US$676m, a US$104m decrease from the March 2017 quarter, as record revenues were offset by higher fuel prices and other increased costs including a US$44m impact from severe winter weather. Delta’s adjusted operating revenue of US$9.8bn for the March quarter improved 8%, or US$715m versus the prior year. This revenue result marks a March quarter record for the company, and was driven by improvements across Delta’s business, including a 23% increase in cargo revenue and a US$78m increase in total loyalty revenue. Delta generated US$1.3bn of operating cash flow, as the seasonal build of cash was partially offset by the US$1.1bn profit sharing payment to employees and a US$500m voluntary pension contribution in the March quarter, completing funding for the full year. Delta generated US$173m of free cash flow during the quarter, after the investment of US$1.2bn into the business primarily for aircraft purchases and improvements. GECAS and its wholly owned subsidiary, PK Air Finance have concluded a significant aircraft financing transaction covering a total of 51 aircraft operated by Lion Air Group, GECAS' largest customer Southeast Asia. The financing covers 21 Boeing 737-900ER's currently operated by Lion Air and 30 aircraft on order by Lion Air, including Boeing 737 MAX 8’s and 9’s as well as the Airbus A320/A321neo. Inmarsat has signed a deal with low-cost Indonesian airline Citilink. The deal has been signed in partnership with Lufthansa Technik, Lufthansa Systems and Indonesian tech company Mahata Aero Teknologi and will see a retrofit of 50 of Citilink’s Airbus A320s with Inmarsat’s GX Aviation in-flight broadband service. Qatar Airways, the national airline of the State of Qatar and JetSuite, a U.S. private aviation company, has taken a minority stake in JetSuite, and indirectly in JetSuiteX. Qatar Airways joins JetBlue Airways, which will be increasing its investment and a number of private investors as stakeholders in both JetSuite and JetSuiteX. With this investment in JetSuite, Qatar Airways will help fuel the growth of JetSuite’s private aviation business, which currently focuses on light and very light jets. The investment extends to JetSuiteX, the sibling company to JetSuite, further accelerating the expansion of its acclaimed semi-private air service on the U.S. West Coast and beyond. JetSuiteX fills a niche in underserved short haul markets and small airports and enjoys a Net Promoter Score over 90, higher than the major U.S. airlines. JetSuiteX operates its fleet of Embraer 135 aircraft from private terminals in California and Nevada, with no lines, no waiting and no stress, at a price competitive with commercial travel. The Qatar Airways investment will enable faster expansion of this fleet and the ability to reach new destinations, including the potential to bring the semi-private model to additional U.S. regions.